I received some fabulous Kashmiri beads in matching colors but slightly different shapes and styles, so I decided to use them all together in a project. Here's a bracelet that you can put together really quickly, which would be perfect for holiday gift giving, or for yourself for holiday parties! Don't miss the earlier tutorial that I shared which used an unmatched set of these beautiful beads to make a one-of-a-kind Maruti bead necklace! The measurement of your wire and your bead count will vary depending upon the size of your wrist and what size beads you use. 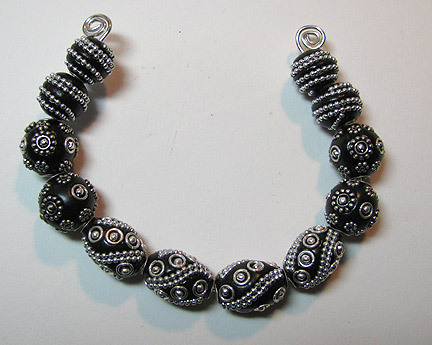 The nice thing about this style of bracelet is that you can make the clasp with a shorter or longer hook, or you can add jump rings to adjust the size perfectly. 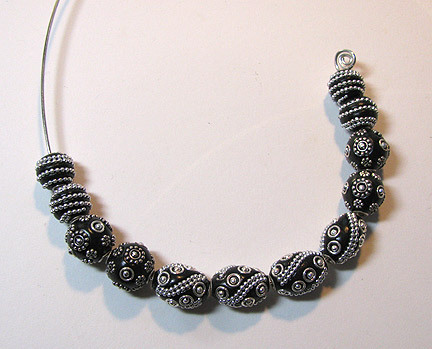 I used just over 16 inches of 16 gauge sterling silver wire, 6 Kashmiri beads from MarutiBeads.com, and that's it! The tools needed: round nose pliers, chain nose pliers, wire cutters, measuring tape, small file, ball peen hammer and steel block. 1. 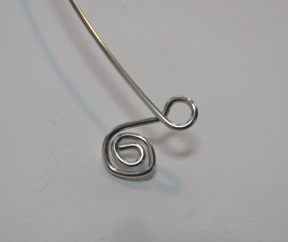 Turn a spiral on one end of your wire, leaving an open hole in the middle (for the clasp). Another 16 gauge wire must fit through it. I used about 1-1/2 inches of wire for the spiral. Add the beads to the wire. 2. Turn a spiral on the other end, using the same amount of wire it took for your first spiral. 3. Using another piece of wire (mine was 5-1/4 inches long), turn another loose spiral and begin the first step of a wrapped loop as shown. 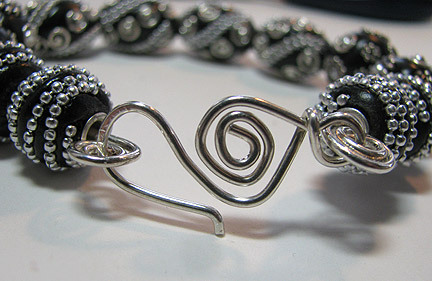 Turn the loop large enough to fit through one of the bracelet spirals without pinching. 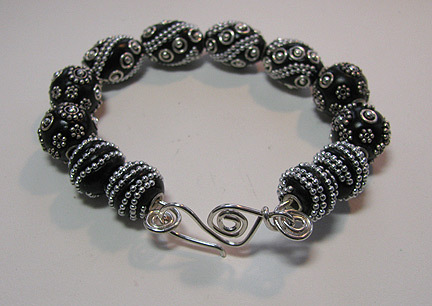 Slip the wire end and the loop through one of the bracelet spirals before finishing the clasp. 4. Finish the hook shape as shown, and use a ball peen hammer to flatten and harden the spiral and hook. Be careful not to hammer where the wires cross on the small loop. Very pretty. I love these beads.